When the Queen heads to her Scottish home we can get inside Buckingham Palace and this year the summer opening is from 25 July to 25 September. 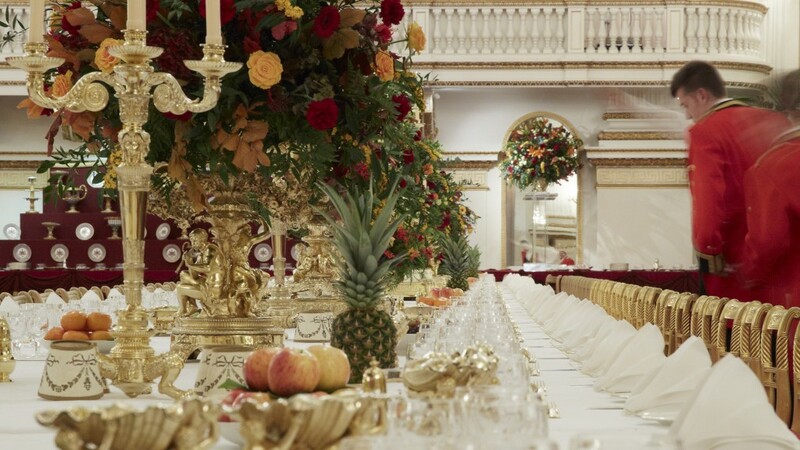 We can enjoy A Royal Welcome as the State Rooms will recreate the settings for state visits, receptions, garden parties, investitures and private audiences. For the first time ever, visitors to the Summer Opening will enter the State Rooms through the Grand Entrance, used by those who come to the Palace at the invitation of The Queen. For more royal treats, Clarence House is also open this month. This is the London home of Prince Charles and Camilla and you can visit from 1 to 31 August for a guided tour. Across the other side of St James’s Park, you can also visit the Houses of Parliament this month. While we now have regular Saturday opening, during the parliament summer recess we can visit Monday to Friday too. 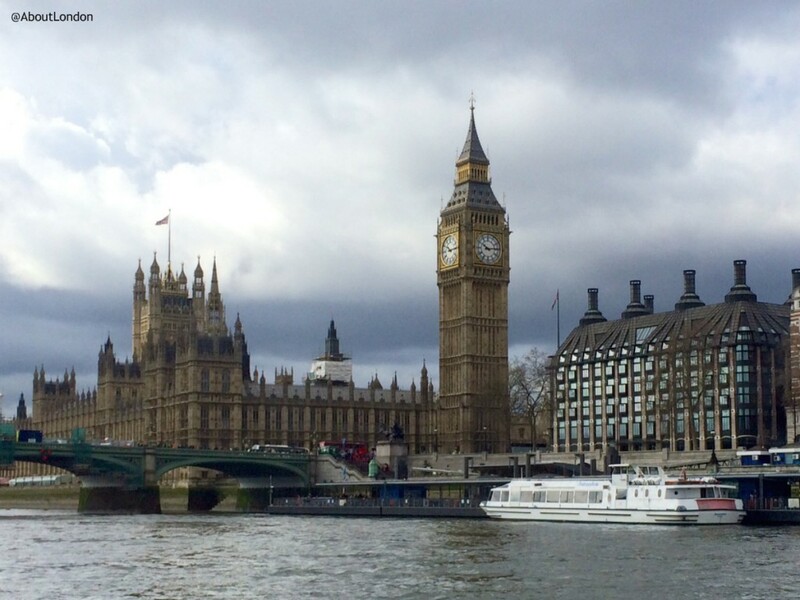 Tours are available at the Houses of Parliament from 27 July to 4 September. There are also art and architecture tours across the road at Portcullis House on 21 and 28 August. Nearer to London Bridge Hotel, at Balls Brothers in Hays Galleria there is London’s only covered, outdoor pétanque pitch. This wine bar has a happy hour from 5-8pm to help you unwind. And for a place to get away from it all, open until 31 August the churchyard at Southwark Cathedral has been restored with access via the west end on Cathedral Street and the Millennium Courtyard. Special events this summer include free music at lunchtimes, a giant chess set, and a prayer labyrinth. It’s always the right time of year for a stroll along the South Bank. This car-free, riverside promenade offers some wonderful views of London landmarks too. 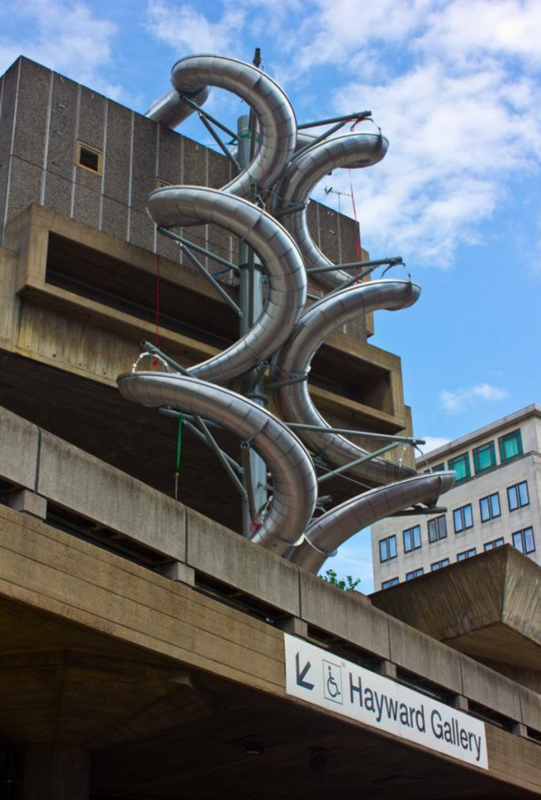 Do stop at The Hayward Gallery to see the Carsten Höller exhibition which includes these fantastic slides as a way to exit from the top floor to the gallery entrance! They call this art but I call it a lot of fun for grown-ups. The exhibition closed on 6 September. Also on the South Bank, the London Eye has late evening opening for the summer. Every Friday until 21 August the London Eye will be open until midnight which is a rare treat to see London twinkling late at night. And a short walk from there to the Imperial War Museum gives you the last chance to see Fashion On The Ration. An exhibition that looks at how fashion survived rationing during wartime 1940s. The City of London had a Roman Amphitheatre and you can see the remains under the Guildhall Art Gallery. But up at a ground level there’s a fantastic opportunity this month to actually see a reenactment of Roman London with the Gladiator Games. 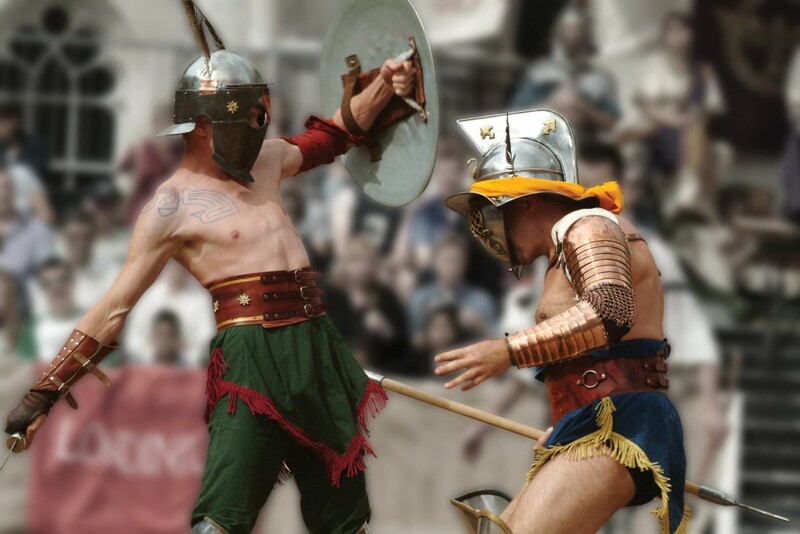 From 8 to 16 August, there will be swords, shields, spears and cheers with a realistic portrayal of combat. This is a family event but the simulated violence may not be suitable for very young children. Also in The City, Ride London is on 1 and 2 August and is a cycling legacy from the London 2012 Olympic Games. On the Saturday there’s a FreeCycle which everyone can join and there are lots of festival stops for you to take a break. While Hamlet at The Barbican has been sold out for months, because it’s Benedict Cumberbatch in the lead role, Shakespeare’s Globe has plenty on this month. For something more unusual, The Ghost Sonata is on at The Rose Playhouse, an indoor archaeological site, from 4 to 28 August. What is real? What is not? Who is alive? Who is dead? What do we mean to each other and how can the smallest of our actions change another person’s life? Lots to think about there then. 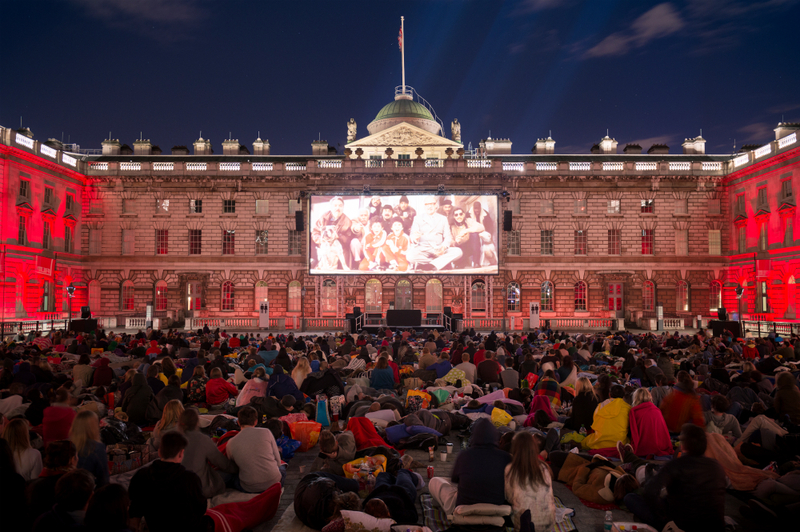 Film4 Summer Screen at Somerset House means open-air movies in the beautiful courtyard setting from 6 to 19 August. There are also live DJs to create soundtracks inspired by the films. For musical joy, start spreading the news as ol’ Blue Eyes is back in town. Sinatra is on at The London Palladium until 10 October to mark his centenary year with rare footage, a 24-piece orchestra and a dance show. And an utter delight for families, Jacqueline Wilson’s Hetty Feather is brought to life on stage at the Duke of York Theatre from 6 August to 6 September. 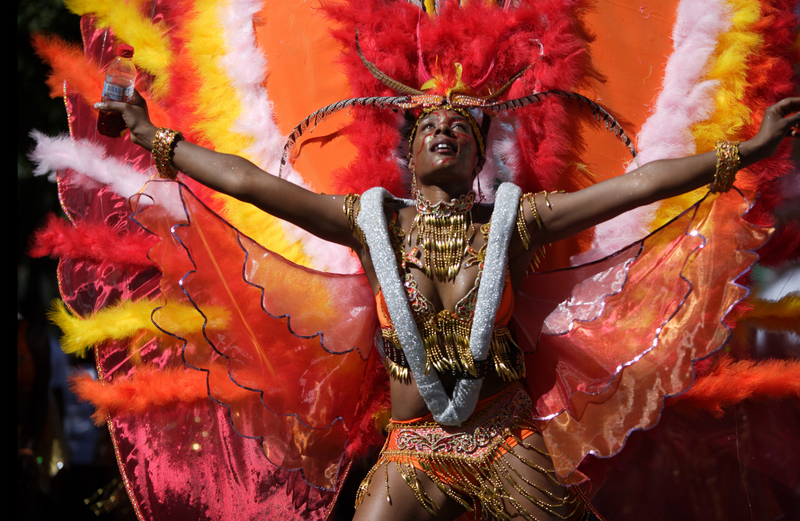 London’s annual Caribbean carnival spectacular is the Notting Hill Carnival on 30 and 31 August. Expect incredible parades and music that will get you dancing. An alternative idea is Sail Royal Greenwich on 27 to 31 August. There are cruises available and fireworks in the evening, and two enormous vessels will be moored at Greenwich. If you would like even more ideas for this month have a look at the Things to Do in London in August 2015 from Kensington House Hotel, our sister hotel. Totally Thames is on for the whole of September and has lots of special events to look forward to including a chance to get inside the bascule chamber at Tower Bridge for a concert. Southbank Centre will be having fun with the Africa Utopia Festival on 10–13 September 2015, and the National Theatre will have the often seen on TV and film but less so on stage, Jane Eyre, from 8 September. It’s the Bermondsey Street Festival on Saturday 19 September, and The World Goes Pop opens at Tate Modern on 17 September taking a world view of pop art beyond western consumer culture.